A German photo album featuring Adolf Hitler with children (photo 1) is part of a donation from the José María Castañé Foundation and was in a summer exhibit at Houghton Library. Leslie Morris (photo 2), curator of modern books and manuscripts at Houghton Library, said the material will give scholars interested in 20th-century history a hint of the potential for new research and teaching opportunities within the collection. The archive is focused on pivotal political and military events of the 20th century, and includes this German children's book featuring a young Hitler (photo 3). Transcripts and recordings of the speech are available at the Truman Library and through countless sources on the Internet. But what those easy-to-find records miss is an important nugget of history. 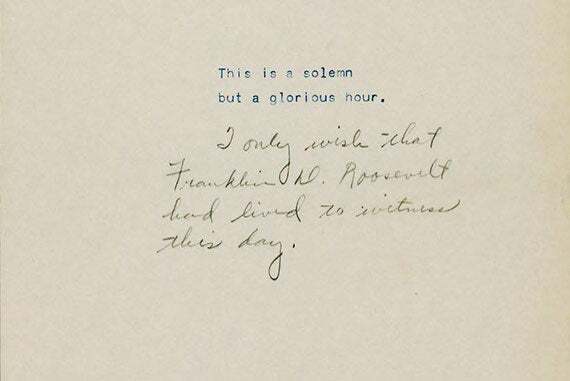 The second sentence of the speech, a remembrance of President Franklin Delano Roosevelt, who had died less than a month earlier, was a late addition. “I only wish that Franklin Roosevelt had lived to see this day,” Truman wrote under the opening line. The document — the actual transcript Truman used for the broadcast, with his handwritten notes — is part of a collection of historical papers, manuscripts, books, photographs, and other media donated to the Harvard Library by the José María Castañé Foundation last year. The Castañé collection of about 3,000 items is keenly focused on major conflicts and transformative events of the 20th century, including the Russian Revolution, the two World Wars, the Spanish Civil War, and the Cold War. A small selection on display at the Houghton Library this summer served as an introduction. Leslie Morris, curator of modern books and manuscripts at Houghton Library, said that the aim of the exhibition is to give scholars interested in 20th-century history a hint of the potential for new research and teaching opportunities within the collection. The collection is vast in its store of individual pieces, including some 10,000 photographs, pages of document sets, and books. Also included are personal items from key leaders, such as Winston Churchill’s daily engagement cards, kept by his secretary, John Colville. Each item seems to shed light on a moment in history — some well-known, others more obscure. A page of minutes from a meeting of the last Russian Provisional Government captures a diatribe from Marxist revolutionary Leon Trotsky that helped spark the Bolshevik revolution. Albums of photos taken by German soldiers during World War II, including images of Adolf Hitler playing with a child and socializing with Benito Mussolini and Nazi leaders, are also included in the collection. One of the artifacts recently on display was a detailed diagram of the atomic bomb run on Hiroshima by the navigator of the Enola Gay, which shows the flight path of a second plane circling in reserve if the first pass failed. Truman’s speech marking the end of the war in Germany was also part of the introduction. The collection is the work of Spanish businessman and patron of the arts Castañé, who said his interest in history dates back to his childhood in Spain in the aftermath of the Spanish Civil War and during World War II. Following the death of his son, in 1985, Castañé began to collect historical documents as an outlet for his grief. Soon he was on a quest to create a world-class collection. Over three decades Castañé created a collection of more than 7,000 pieces, many with multiple objects, boosting the actual number of items to the tens of thousands. In 2004 Castañé created a foundation to protect his holdings. Last October he donated a portion of the collection to the Harvard Library. Castañé said gifting the collection to the Harvard Library expands the possibilities for its use in research and teaching, because the University’s collections and online materials are an important source of information and point of access for people around the world. The library is in the process of cataloging the collection, but individual books and periodicals can be found in the Harvard Library portal HOLLIS by using a keyword search collection for José María Castañé Collection. Access can also be arranged in advance by contacting the Modern Books and Manuscripts Department.